Winnipeg has become a pretty comprehensive city. We really do have it all. We’ve got world class museums, amazing restaurants, renowned arts and culture, vibrant performing arts, polar bears, great walkable neighbourhoods incredible outdoor adventures and so much more. If there was one quibble, it was perhaps that we were missing an outlet mall. That bastion of good deals and great shopping that can really make or break any destination. Well fear not, your days of escaping south of the border for deals that don’t exist anymore (hello 30% exchange rate) are over with the opening of Outlet Collection Winnipeg, the largest outlet mall between Calgary and Toronto. Recently, a colleague and I had the very arduous job of touring the sparkling new mall in all its glory (it’s a tough job, but someone has to do it). Greeted with a plethora of shops new to Winnipeg and armed with credit cards in hand, we giddily made our way from bedecked store window to bedecked store window. Noteworthy additions to the city’s shopping scene include Portia Ella. This online retailer considers itself the Canadian equivalent to Sephora with a twist, carrying only natural and ethically sourced Canadian made skin care and beauty products. Winnipeg is home to its very first bricks and mortar store in the country. Other newbies include DSW (aka Designer Shoe Warehouse) which is basically hundreds and hundreds of shoes of every size, shape and colour all lined up just waiting for you to come along and give them good homes. Shoes and more shoes can be found at Famous Footwear. We were also thrilled to see Saks Off Fifth, which carried designer brands from its famous namesake, bringing a little piece of the Big Apple to the prairies. When one of the walls told me to ‘sparkle like you mean it’, I knew I’d found my happy place. Truly, words to live by. Apparently we are a city of fit bodies because OC Winnipeg is home to several new women’s fitness stores including Lole a Montreal based active wear brand that boasts the softest and silkiest leggings I’ve ever felt, and NoMiNoU, a Vancouver based brand that features eco-friendly, made in Canada active wear that features designs from Indigenous artists, offering up something truly original to behold. Other noteworthy additions include the Banana Republic Factory Outlet (a personal favourite) and Justice–if you have a 5-10 year old who loves all things pink, sparkly and rainbow, be prepared to spend your future Saturdays here. The mall informs me Justice is set to open this fall, and my 5-year-old is eagerly awaiting that day. No mall can be complete without a proper food court and OC Winnipeg is no exception. With our stretch pants on, we embarked on smorgasboard starting at Chachi’s where we tried the Mac ‘n Cap featuring a ciabatta bun topped with macaroni and cheese, red pepper spread and then stuffed with potato chips. We couldn’t make up this combination if we tried. And well, it was as delectable and decadent as it sounds. We washed that down with gulps of black cherry iced tea and bourbon vanilla lemonade. 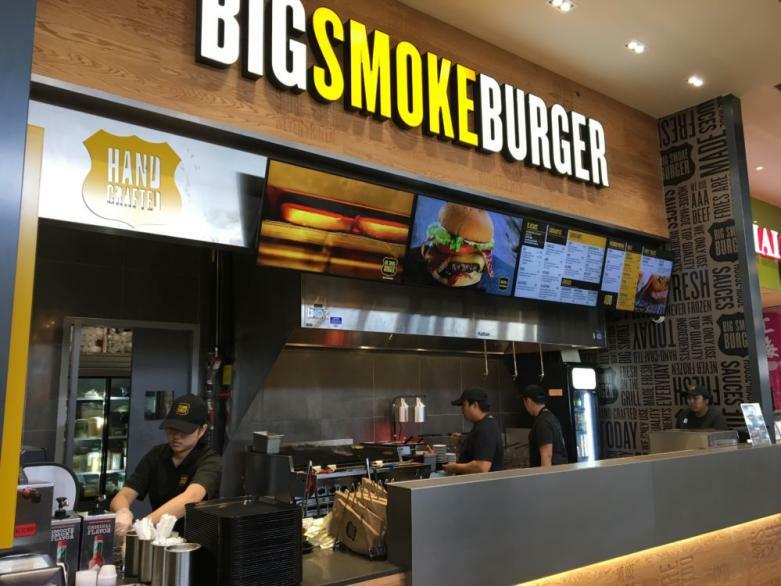 Not content with merely one sandwich, we headed next to Big Smoke Burger where we opted for the classic double burger that you can watch being made on a sizzling flame right in front of you paired with thick crispy onion rings. To finish things off was an ice cream sandwich made with soft and moist chocolate chip cookies stuffed with creamy chocolate ice cream. Places we’ll test the elastic on our pants next time include the Mexican resto BarBurrito and Korean outlet Kimchi. We all know malls are as much about the details as they are about the stores themselves. A great mall offers up comfy places to sit and can even be a place to enjoy art. Again, OC Winnipeg delivers. The airy corridors soar high overhead, its exposed beams giving it a modern open feel. Cozy couches flanked by greenery are the perfect place to stop for a rest and a local photo wall was one of our favourite spots to stop and snap a photo. The combination of tiled floor and carpets gives both a comfortable and sleek feeling, while a custom art piece hanging in the food court made of hockey sticks gives the space a distinctly Canadian feel. Winnipeg Outlet Collection is located at 555 Sterling Lyon Parkway across from the IKEA.